Remember when you were you first had your hands on the first Pokemon titles, and all of the numerous rumors that people said were in these games as well. Some of these rumors were, Missing No. deleting your save data, some how catching a Yoshi, holding B helps your success rate on capturing Pokemon’s, and of course, encountering a Mew under the truck by the St. Anne. Well of course all of these were just rumors, until recently. Restart your game and play until you get HM02 Fly from the house west of Celadon City. The Youngster with a Slowpoke (Level 17) on the road to Bill’s house (Route 25). He is the fourth trainer after you cross Nugget Bridge, standing directly above a female trainer and facing north. The Gambler with two Poliwags and a Poliwhirl (all Level 22) between Lavender Town and Saffron City (Route 8). He is standing just east of the entrance to Saffron City, facing north toward the door of the Underground Path. Now carefully follow the series of steps illustrated below. Make sure you have a Pokémon that knows Fly. On Route 8, stand in front of the door of the Underground Path. Save your game, since saving after this point will disrupt the procedure. Walk down one step and immediately press Start. If you succeed, the menu will pop up before the Gambler “sees” you. Go to the Pokémon list and fly to Cerulean City. The Gambler will see you just before you fly away. Your Start button will no longer function. Go north across Nugget Bridge and head east until you find the trainer in this picture (he’s the Youngster described above). If you walk right up to the Youngster, the game will lock up, so you’ll have to let him see you and walk up to you. Defeat his Slowpoke (afterwards, your Start button will work again), then fly to Lavender Town. Head west into Route 8. …and look who it is! 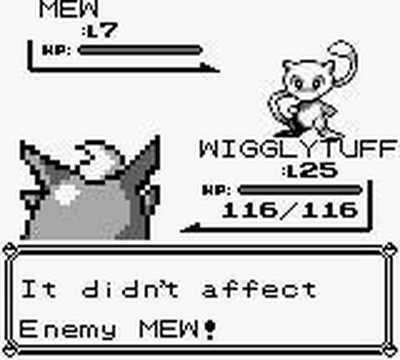 Mew will be at Level 7 and its only attack will be Pound. Pokéball, go! And there you have it, a level 7 Mew of your own to show off and train. Below there is also a video of more glitches and an alternative way to capture a Mew for Blue/Red/Yellow, be sure to check them out as well.